When you launch the application, you will see the first dialog window that invites you to drop folders you want to scan. Just move individual folders to the window or click the Add Folder button to add folders or whole disks (it supports both external or internal volumes) for scanning. You can also choose to scan your Home folder in one click right from this window. Then click the Scan button. When the duplicate scanning starts, you will see the chart animation of the search process. It will take from 1 to 2 minutes to get the results. 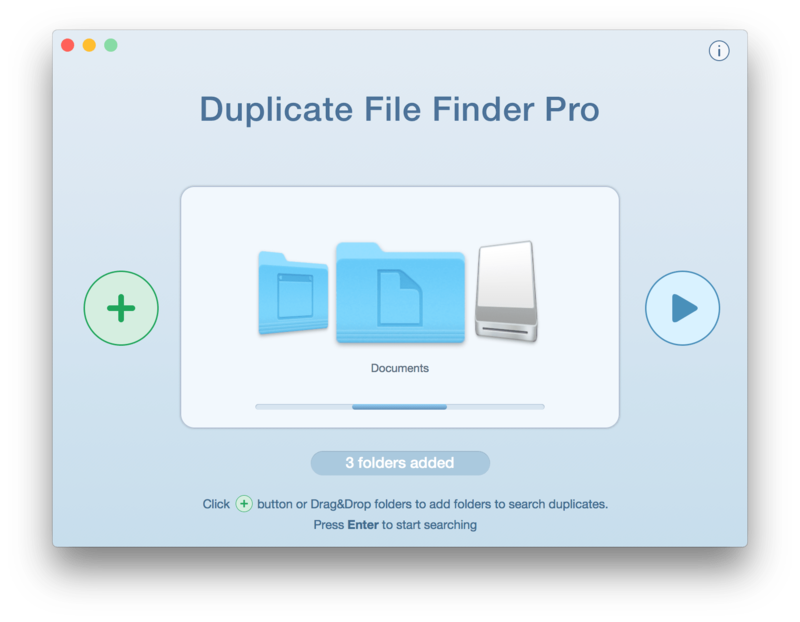 After the scan is complete, Duplicate File Finder will display the Overview tab. 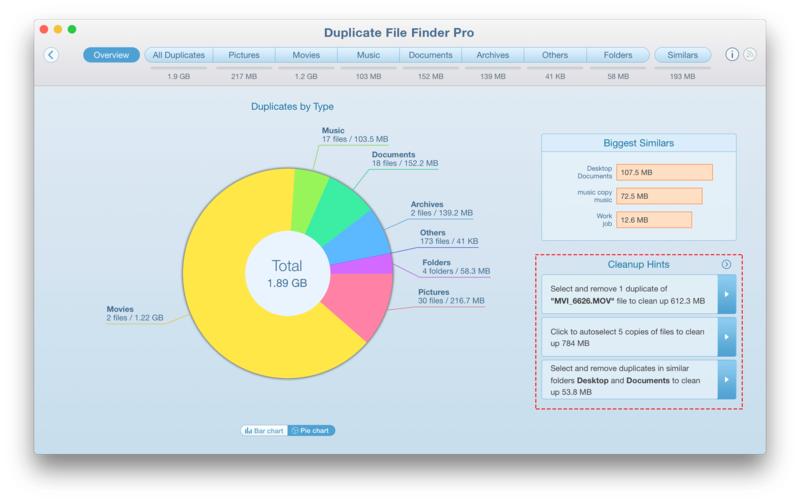 Here you can view how many duplicate pictures, movies, music, documents, archives, folders, and even similar folders, you have. For your convenience, you can preview the details displayed as a Bar chart or Pie chart. 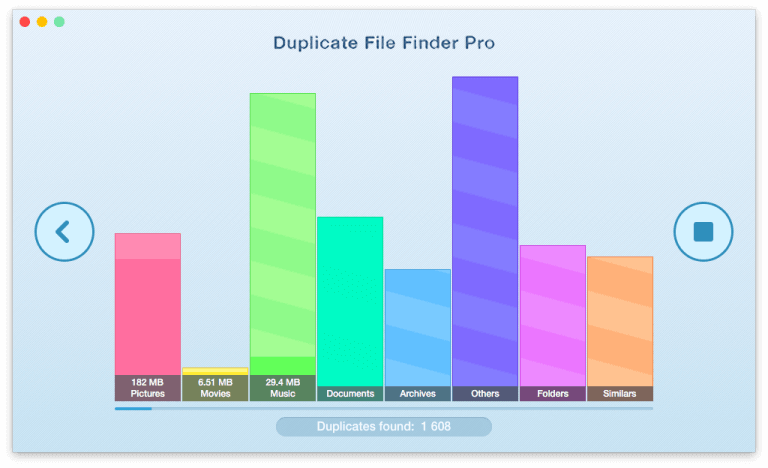 In addition, if you have similar folders (folders that contain a mix of duplicate and unique files), here you will find the information about them and even fast cleanup hints that will help you make the selection of the duplicates easier and more efficient. 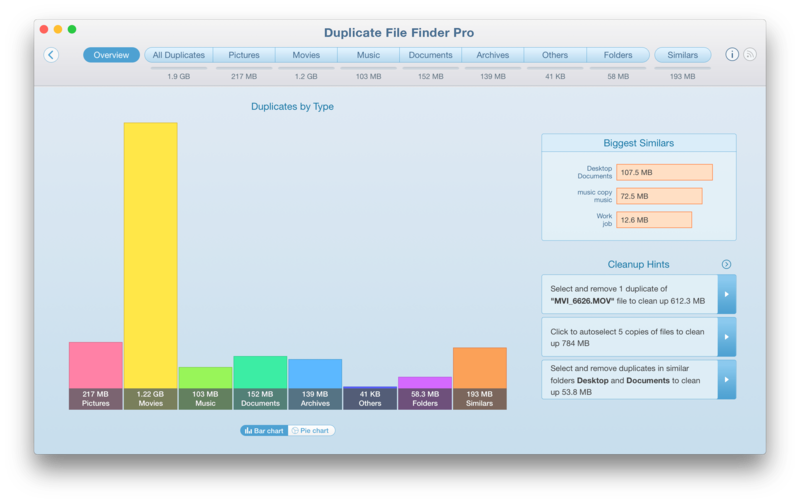 You can follow the cleanup hints or go to each file type category and select the duplicates manually. At the top of the window you will see different tabs. 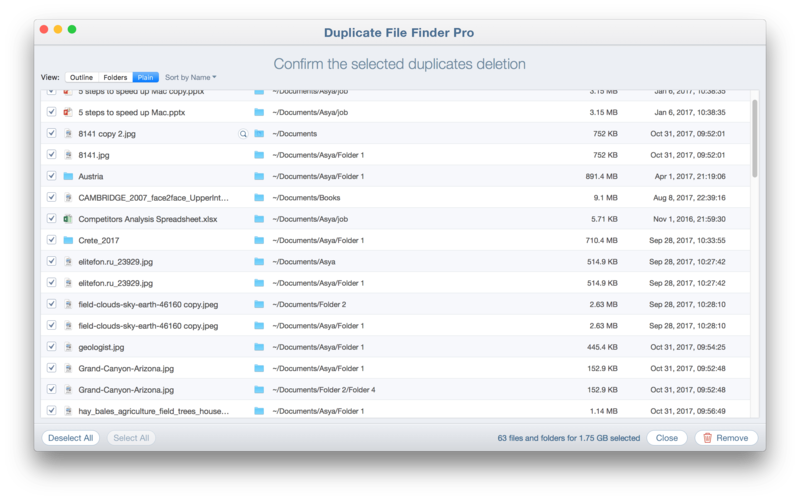 Click on each one to preview duplicates of different files types (music, video, documents, etc.) 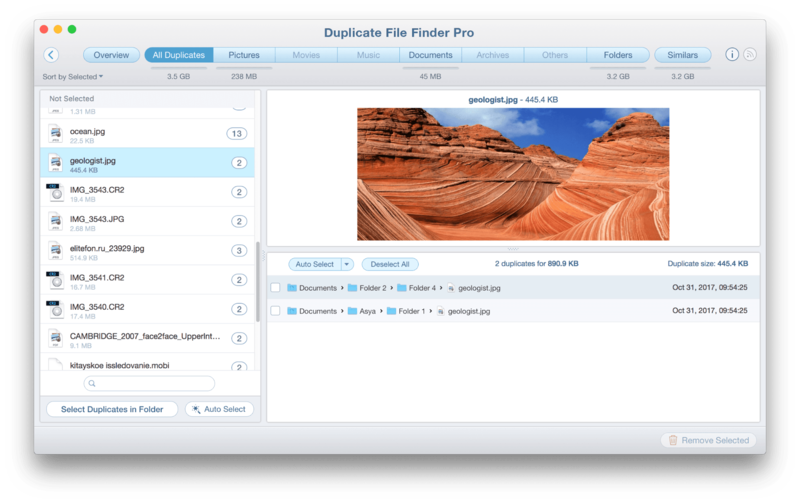 There is also an All Files tab, where you can preview duplicates of all files types. Additionally, in each tab you will find the list of duplicates and the directory in which they are located. Preview the files and select those you want to remove. 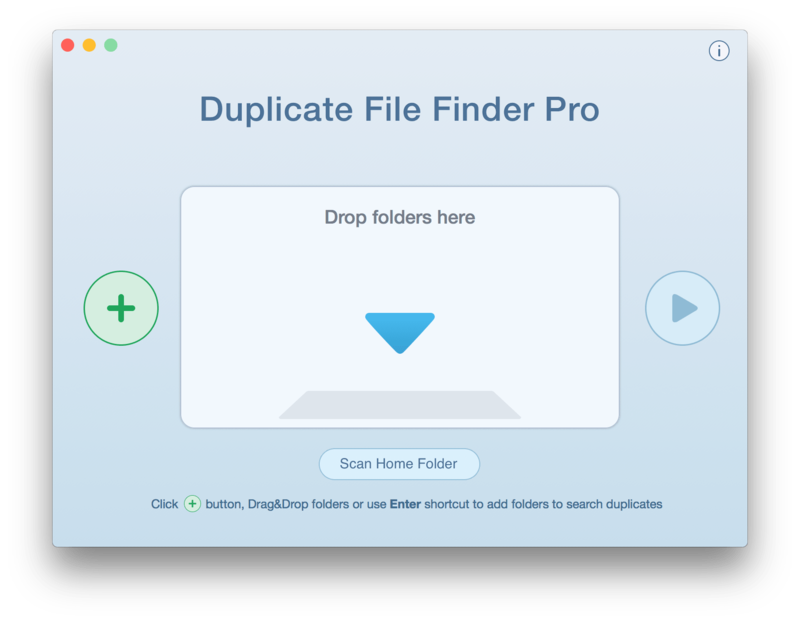 If you have thousands of duplicates and need quick ways to select duplicates, use the Autoselect button. It will select the duplicates automatically and you will just need just to preview them and confirm their removal. The last step is to delete duplicates by clicking the Remove Selected button. You will see the list of all selected duplicates. Preview them and confirm by clicking on Remove. If you want to keep some of the files, just uncheck the checkboxes by the names of the files, and they will not be deleted.